Emerald Media - Thanks to all the journalists who joined us on our recent successful press trip to Kazakhstan with Air Astana. 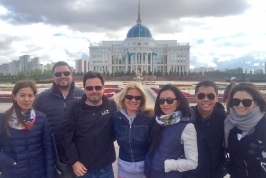 Thanks to all the journalists who joined us on our recent successful press trip to Kazakhstan with Air Astana. Liz Moscrop, Inflight Magazine; Olga Pak, Air Astana; Benson Ang, Straits Times and Danielle Yong, Travel Weekly Asia.